Never has the phrase “game of two halves” been more applicable than England versus Mexico in Saint-Malo on Sunday afternoon in the final match of Group B play in the U-20 World Cup. Mo Marley made just one change as she reverted to the team that beat Korea DPR a week ago with Lauren Hemp returning in place of Charlie Wellings. A first half which lacked spark and intensity saw Mo Marley’s side trail 1-0 at the break due to a superb goal from Jacqueline Ovalle, a breakout star who didn’t deserve to be going home after the group stages. But it was a goal of England’s own making. Maz Pacheco had stayed back for a corner and ended up picking up a loose ball on the right-hand side. Once England lost possession, both full backs were on the same side, allowing Mexico to switch play and give Ovalle a chance to put them ahead. But England just wasn’t there in the first half. The ball wouldn’t stick. Too often players lost possession. Stanway and Kelly were largely anonymous, Hemp frustrated, and Russo trying to break the lines with her running. 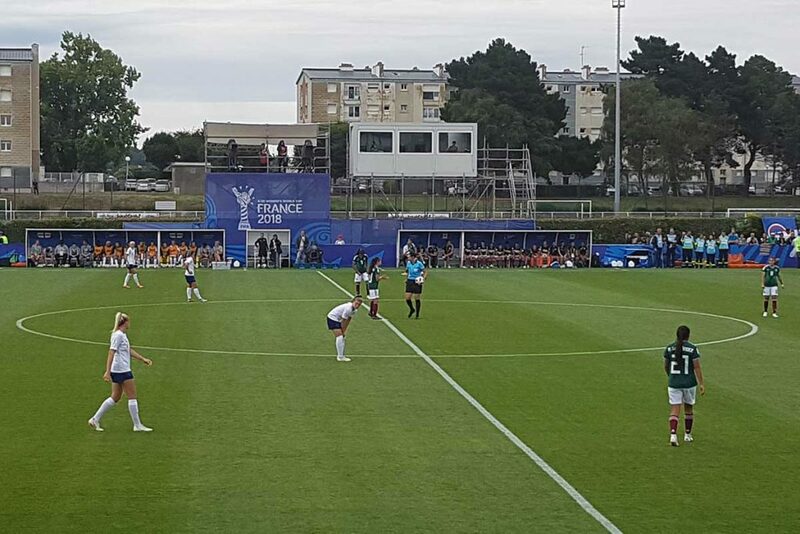 Both Chloe Peplow and Mollie Rouse in midfield picked up bookings as they struggled to control a rapid Mexico, with the latter will now miss the quarterfinal clash with the Netherlands due to suspension. It was hard to see what unfolded in the second half coming at the break. 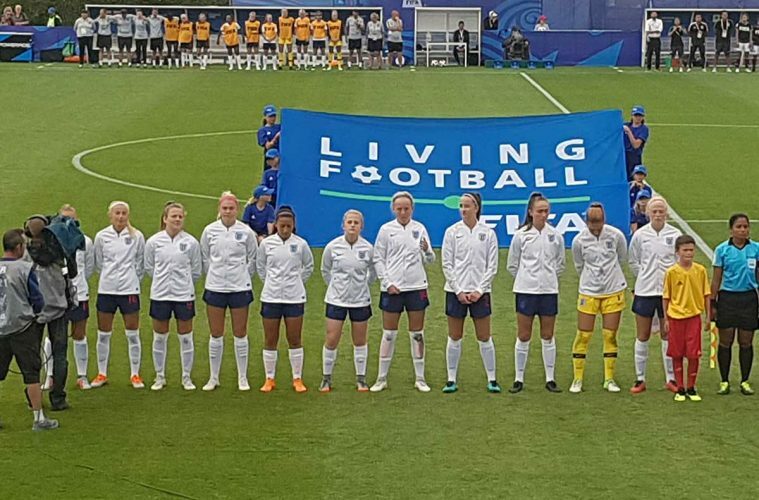 The young Lionesses had mustered just one shot of significance, that from the brightest performer of the first half, Lauren Hemp. Mexico had taken control of both the game and the group. Their intensity, high press. and desire meant they were first to every ball, something which captain Grace Fisk said was the catalyst for England’s comeback. There didn’t appear to be any tactical switch, just a complete siege mentality among every England player on the pitch. All the talk both during the tournament and leading up to it had been about a new mind-set, a fresher mind-set. The trip to the Royal Marines had given England inspiration, you’d have almost been forgiven for thinking a marine was in the dressing room at halftime such was the turnaround in performance. 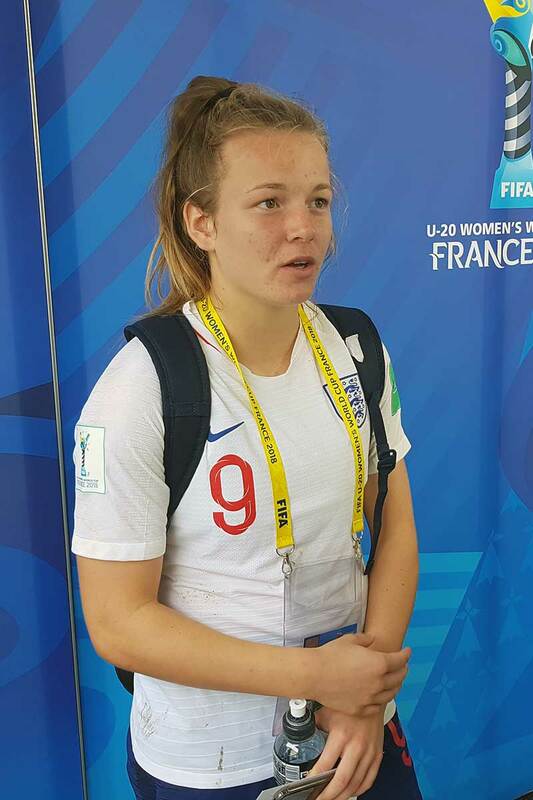 First it was Alessia Russo, so often England’s star performer in France over the past week. Just after an almost unbelievable series of events had denied both Chloe Kelly and Megan Finnigan an equalizer, Russo slotted home after rounding Emily Alvarado to make it 1-1. It was the spark that would turn into a flame that would turn into a bonfire. Within minutes, a long ball was flicked on for Kelly to hammer home a second, before soon-to-be hat-trick hero Hemp got in on the act with a cool finish center of goal. Mexico’s heads had gone. The press had stopped and the intensity evaporated, something Fisk believes her teammates realized pretty soon. With all of England’s four attackers on the board, Georgia Stanway didn’t want to be left out and she ensured she wasn’t with the goal of the game. The midfielder rolled her marker in the middle, drove at the Mexico defense and unleashed an effort that went in off the post to make it 4-1, all four within 20 minutes of the restart. England sniffed blood. Kelly was the next to have a go from range, her shot spilled by Alvarado, allowing Hemp to sweep home her second of the match. Under the pressure of knowing they were going home at halftime due to Korea DPR beating Brazil, a group of players primarily made up of teenagers had shown their mentality was not one to be fooled around with. There was time for a sixth and almost more. It turned out to be Hemp’s hat trick. The goal wasn’t the best she’ll ever score as the ball squirmed in after she’d stumbled over Alvarado, before tournament debutant Niamh Charles struck the post soon after. What was the secret? There wasn’t one. No rowing at halftime, no passionate team talk. Pacheco says Marley trusted the players and allowed them to carry out the game plan. “Mo didn’t say a lot. It came from us and that shows the standards we’ve set and the belief and trust we have in each other. Mo is our manager but we know what we needed to do, she just encouraged us and kept it positive. She trusted us.